New digital technologies have radically transformed the face of journalism in general and photo journalism in particular. These new technologies have not only made it easy for photo journalists to obtain images and to transmit them quickly to newsrooms and consumers across the globe, but they have also provided limitless opportunities for photo manipulation to take place, thus raising questions about the authenticity of those images. This has led to some scholars calling for the rethinking of media ethics to address these ethical dilemmas. 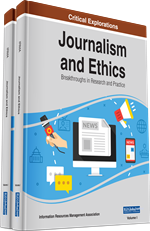 This chapter, therefore, examines the codes of conduct for journalists in ten southern African countries to ascertain whether they have responded to this ethical dilemma brought in by the new digital technologies and if so, whether these responses give adequate guidance to journalists when called upon to make ethical decisions while processing photographs. The concepts of truth, reality and accuracy are also interrogated in the chapter. Findings revealed that most of the codes which do not make reference to photo manipulation are outdated and that those which do, are not comprehensive enough to give guidance to photo journalists. New digital technologies, such as smart cell phones, Adobe Photoshop and Silicon Beach Software’s Digital Darkroom, to mention a few, have radically transformed the face of photo journalism, raising concerns about their impact on the ethics of photo journalism. These digital technologies have not only made it easy for professional photo journalists to capture, process and transmit images within minutes to newsrooms all over the world, but they have also brought with them limitless opportunities to manipulate photos, for example, by moving objects from or within the frame, adding elements which did not exist before or putting together two frames to make one. This manipulation has, in some cases, resulted in the distortion of news, promotion of propaganda and also in individuals or organisations being harmed (see Horner, 2015; Besark, 2006). The exponential increase in the number of photo manipulation scandals that continue to rock the world of photo journalism all over the world proves that this ethical dilemma is on the increase in the 21st century. The well-publicised TIME magazine’s publication of the deliberately darkened face of OJ Simpson on their cover page is a case in point (Hofer & Swan, 2005). Other notable examples include Los Angeles Times photographer, Brian Walski’s splicing of two photographs of a group of British soldiers in Iraq to create one photograph (Bersak, 2006); the University of Wisconsin’s digital insertion of the image of a black student in a crowd of white football fans to give the impression that the university respected diversity in its enrolment (Hofer & Swan, 2005); the Reuters journalist’s manipulation of a photograph to increase smoke billowing from a building in Beirut, in order to create the impression that Israel’s bombing of that city was worse than it really was (The Reuters Photo Scandal, 2006); and Egypt’s state-run newspaper, Al-Ahram’s doctoring of a photo of the Egyptian president Hosni Mubarak walking in front of the Israeli, US, Palestinian and Jordanian leaders, yet in the original he is walking behind the other leaders (BBC, 2010, September 15). In recent times, 2015, the ethical dilemma of photo manipulation was underscored at the World Press Photo competition in which several images were disqualified and a major prize revoked because of excessive manipulation, staging and misleading captions (The New York Times, October, 16, 2015). The increase in the number of scandals related to photo manipulation have prompted some scholars to call for the rethinking and the reinvention of media ethics, in order to address the ethical challenges brought by new media technologies (Horner, 2015; Bersak, 2006). The ease and the stealth with which photo journalists are manipulating photographs prompted Gladney and Ehrlich (1996, p. 506) to suggest that photo manipulation should be placed in the 21st century list of “ethical pitfalls”. Thus, this chapter analyses the journalistic codes of conduct of ten southern African countries in the era of digital technologies to ascertain whether they have taken cognisance of this new ethical dilemma and if so, what stipulations they have put in place to address it.